Methods and Mechanics sheds new light on the playing and concepts of one of the most exciting drummers of our time. 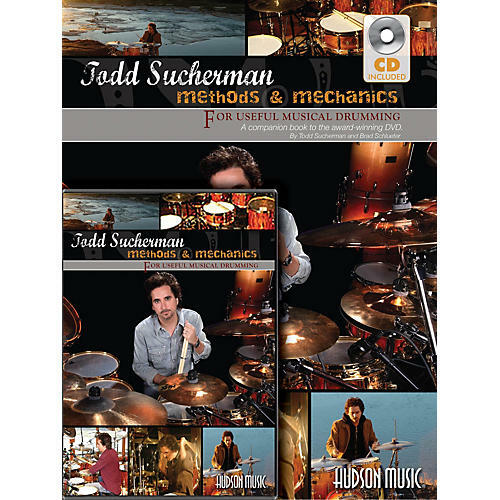 Built around note-for-note transcriptions by drummer/educator Brad Schlueter, the book also includes detailed commentary from both Todd and Brad about the concepts contained in Todd's playing. Included in this package are 8 songs, 5 breathtaking solos, and several of Todd's custom drum lessons (highlighting his approach to double bass drumming and hybrid rudiments on the kit). All of the songs and solos are included on the CD, as well as drumless play-along mixes of all four of the Taylor Mills songs. This book serves as a complete package to analyze, practice, and understand some of the concepts employed by Todd with artists such as Styx, Brian Wilson, Jerry Goodman, Peter Cetera, Brian Culbertson, Spinal Tap, Michael Bolton, The Falling Wallendas, Eric Marienthal, and many others. The DVD is jam-packed with performances by Todd, instruction on hand and foot technique, quick tips, and much more!